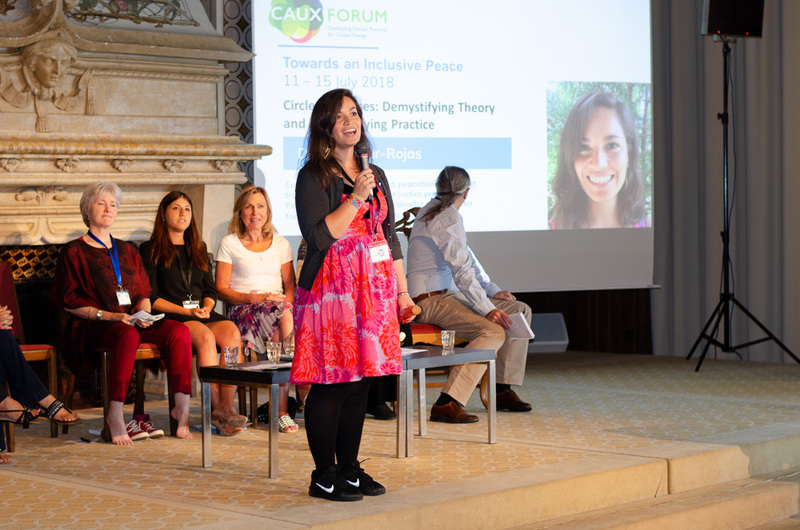 Eastern Mennonite University’s Center for Justice and Peacebuilding was represented at the Caux Forum in Switzerland this summer by six alumni, faculty and staff. The forum, which takes place in the Caux Palace overlooking Lake Geneva above the city of Montreux, began in post World War II Switzerland. It welcomes approximately 1,500 people to its annual events from across civil society, government and business sectors to be inspired, equipped and connected, and promotes building bridges across societal and other divides with the aim of building “a just, sustainable and peaceful world,” its website says. Its approach includes reflection and storytelling – and inviting participants to serve the community by helping with tasks at the center. The sharing of menial tasks at the Caux Forum gives participants “a unique way to connect with each other …, places everyone on equal footing and breaks down silos,” its website says. 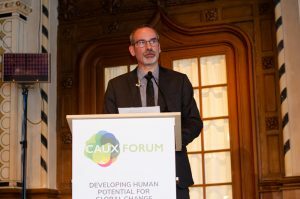 Center for Justice and Peacebuilding professor and Caux Scholars Program academic director Carl Stauffer was a keynote speaker during the Caux Forum. CJP professor and Caux Scholars Program academic director Carl Stauffer was the restorative justice keynote speaker for TIPS. Mohammed Abu-Nimer, a former Summer Peacebuilding Institute instructor and a professor at the School of International Service at American University and founder of the Journal of Peacebuilding and Development, also spoke at the TIPS conference. Aaron Oda MA ‘16 was a lead facilitator for the Peace and Leadership Program, which offers training and experience for addressing global change. Jonathan Rudy GC ‘01, SEM ‘01, senior advisory of human security for the Alliance for Peacebuilding, was a speaker during the “Just Governance for Human Security” conference, for which Ferdinand Vaweka Djayerombe MA ‘06, president of Pax Christi Montréal, served as a technical liaison. Diana Tovar Rojas MA ‘17, CJP’s peacebuilding network coordinator, led a circle processes training in the TIPS conference and represented CJP at a peace fair. Professor Barry Hart previously served as academic director of the Caux Scholars Program and is a current member of the International Council of Initiatives of Change International (IofCI), a worldwide movement seeking the transformation of society. The Swiss IofC organizes the forum. At least eight other CJP graduates have participated in past Caux events, according to Stauffer and Hart.